Some things in life go together wonderfully: mashed potatoes and gravy, pizza and soda, peas and carrots, etc. On the other hand, there are those things which are mutually exclusive – where you cannot have one as well as the other. No matter how hard you try to balance the two of them, they are going to continue to divide your loyalties until one of them obtains your entire devotion. 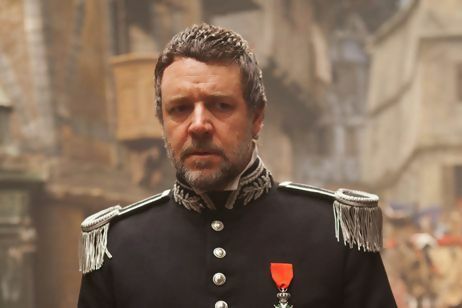 The character of Javert (played by Russell Crowe) is easily one of the most fascinating and complex characters in all of literature. He is driven by total and unwavering devotion to the law, which he sees as the only cure for society’s ills. This belief is ultimately challenged and upended by his encounters with Jean Valjean (played by Hugh Jackman). Valjean is a criminal sentenced to the labor galleys for stealing a handful of bread to feed his starving nephew. He was sentenced to 5 years, but that became 19 years when he tried to escape. Upon finally reaching his parole, Valjean is given identification papers which label him a dangerous man for the rest of his life. However through the benevolence of a humble country priest (in a beautiful and powerful scene), Valjean is given a second chance at identity. He rips up his parole papers and assumes a new name in a new part of the country where he soon establishes himself as an influential mayor. Throughout the film, Javert and Valjean’s lives continue to intersect, usually resulting in Javert trying to unveil Valjean’s real identity and send him back to prison for good. Valjean narrowly escapes Javert’s clutches each time (either through force or through cunning, but never again through outright deception) until finally they come to face to face under circumstances where Javert has been taken captive by revolutionaries and Valjean is given the free opportunity to kill him. However, despite all the turmoil that Javert has put Valjean through – and despite immediate threats by Javert that if Valjean spares him, he will see him imprisoned or killed – Valjean chooses to spare Javert’s life. What happens next is what makes Javert’s character so fascinating and compelling. You see, although it is not highly emphasized in the movie, Javert was born to a criminal father. He was raised in his early years in the very prisons over which he stood guard for so many years. As a result, he devoted his life to escaping the evil of lawlessness in all forms and we get the distinct impression that when he so violently pursues Valjean, he is perhaps seeking vengeance on his own father’s past as well. But after Valjean’s overt compassion and forgiveness, Javert has a crisis of conscience which he does not survive. After vowing to see justice done against the criminal Valjean, Javert – in a moment of shocking compassion and mercy – intentionally lets Valjean escape to save the life of another character. In a lesser story, Javert’s moment of conversion – from legalism to mercy – would be the moment where his character would suddenly find peace and contentment, and would go about the remainder of his days living a life in brighter spirits. But Les Miserables (as a story, not necessarily this filmed version) is a masterpiece of the examination of dual human natures. Les Miserables continually shows in its plot and characters that human beings are at constant war between who we are and who we could be and each new episode in our lives is a chance to either take a new path or stay the course we’ve always known. For Javert, the road ends tragically. Rather than living his life out in awareness of the beauty of mercy, he cannot reconcile his recent merciful compulsion with his life-long quest to uphold the law and he throws himself from a high bridge to end his conflict forever. We could pity him – and perhaps we should – but his character shines a spotlight on a tendency as old as humanity itself and as recent as yesterday’s headlines. We are bombarded daily with voices which cry out for systems and system reforms which will bring about the betterment of our nation and our world. Many see our hope in a particular political system or stronger education. Many profess dogmatic religious or spiritual perspectives or (exactly opposite) they cry for a return to rational thinking which is completely void of faith or superstition. The voices of these opinions scream at each other and at each of us relentlessly, all the while ignoring a profoundly shocking truth about life which Victor Hugo (the author of Les Miserables) so vividly displays in the lives of Javert and Valjean. The truth is that you can lay down the law or you can lay down your life. You cannot do both. We all could make every effort for people to agree with us. Personally, I wish everyone was a Christian because that’s what I am and what I believe to be true. Many of my dear friends do not agree with me (even some who share my faith) and they wish that I would see things more their way for precisely the same reasons. Some even say that reality itself is not absolute and perhaps everyone is right when they do what is right for themselves (I disagree, but let’s not dig too deeply there for now). If we strive to make everything adhere to our system of beliefs, we are laying down the law. This could take the form of fundamentalist religion or fundamentalist atheism or every possible shade in between. Its shape is the same either way. When we strive for that, we are essentially trying to shape the world through the force of our own control. It is my opinion that such extreme positions are kind of like the vaccine that eventually gives you the disease. You will ultimately become what you hate the most. Javert’s character couldn’t live in a world where he himself had betrayed the law because he worshipped the law. But Valjean had made a life by laying his own life down. Valjean gave himself up to save a nameless vagrant who was about to go to prison in his place (in a case of mistaken identity). Valjean set Javert free despite continued threats against his personal well-being. He constantly cared more for others than he did for himself and ultimately this self-sacrifice is what brings profound change in the lives of those he meets. If we are willing to consider others as more valuable than ourselves and are willing to lay down our lives for them, perhaps we may live to see the better world we hope for. This is certainly the example we see in the life of Jesus. But if we stubbornly demand the conformity of others to the system we view as humanity’s cure without being willing to let go of our own lives in the process, chances are strong that we will do more harm than good – perhaps even destroying ourselves as we do. This is the example we see in the lives of the Pharisees. Before nations change, people have to change. There will always be Javerts in the world: men and women obsessed with a calculated system of chartable righteousness. But thankfully, perhaps hopefully, there will also Valjeans: men and women so aware of their own brokenness and need for grace that they offer themselves up freely to their fellow people and become the change they hope to see in the world around them. Great read. I enjoyed your take on the story. It’s one of my favorites since first coming in contact with it during my high school years. Javert is a great character. In the blockbuster of human life, we all know the outcome – no spoiler alert needed. In spite of this inevitable ending, we continue to live our lives, find joy and understand the world around us. Sometimes our path leads us to save the world and sometimes our path is to simply remind our husband where they left their keys – it’s what you make of it and how you deal with it that matters. From cold feet on your wedding day to the comfort of viewing the comic misadventures of others on Reality TV, Spoiler Alert: Everybody Dies reminds us that in the end, we are all in this together.